Ancient Chinese people were greatly interested in the relationships and patterns that occurred in nature. Instead of studying situations and things in isolation, they viewed the world as a harmonious and holistic entity. In their eyes, no single being or form could exist unless it was seen in relation to its surrounding environment. By simplifying these relationships, they tried to explain complicated phenomena in the universe. 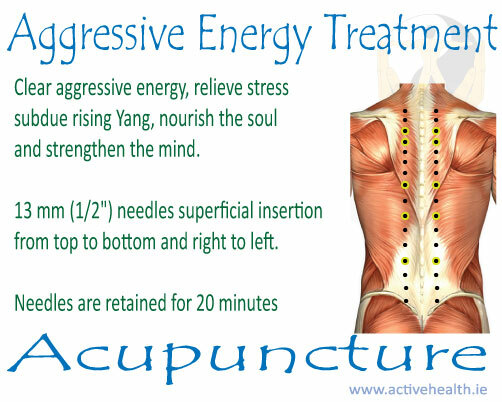 Yang is the energy that is responsible for warming and activating bodily functions. When Yang is in decline or deficient you feel cold and your body begins to slow down, displaying signs of under activity. There are a number of simple methods to tonify Yang. Clinical pIcture: Deficient Yang syndrome is manifested as aversion to cold, cold extremities, soreness and weakness or cold pain in the lower back and knees, impotence, spermatorrhea, sterility, watery leucorrhea, enuresis, pale, wet and swollen tongue coating, deep slow, weak, pulse, wheezing and diarrhea (without odour). Foods to avoid. If you are experiencing Yang deficiency then it is important to avoid foods that will further deplete your body’s Yang energy. Cold food and liquids fall into this category. Here ‘cold foods’ refers not only to those directly taken from the fridge but also to raw foods, as these require extra energy for digestion compared to pre-cooked foods. This may mean choosing a pasta salad over a green salad or switching from muesli to oat porridge for breakfast. It is important to remember that we can change the “nature” of food to warming foods by cooking or warming them. This will preserve their energetic and nutrient value, while increasing their Yang nature, therefore soups, porridge and slow roasted foods show become the dishes of choice for those with a Yang deficiency. The herbs and spices mentioned above are warming and as such in small amounts encourage digestion and circulation throughout the body. While it may seem reasonable to achieve an improved warming effect by using the stronger spices such as black pepper liberally, care needs to be taken as these can be used to excess, inducing sweating which in fact actually has a cooling drying effect on the body. In general, herbs that tonify Yang are warm and dry in nature. They can injure Yin and give rise to fire, so they are contraindicated for a person with deficient Yin and excessive fire syndrome. Incomplete – Come back for more later……….. This entry was posted in Acupuncture, Conditions and tagged nutritional therapy, vital substances on December 3, 2016 by activehealth.ie. This entry was posted in Acupuncture, Qi-points and tagged acupuncture, heavenly start, ma dan yang, TCM on August 5, 2016 by activehealth.ie. This treatment protocol is based on Five Elements and is a simple effective treatment for clearing Aggressive energy, reducing stress, nourishing the Soul, Strengthening the body. Half inch (1/2″) needles are inserted just barely under the skin, from top to bottom and right to left, usually inserting BL-15 as the last point. Needles are retained in the patient for 20 minutes. 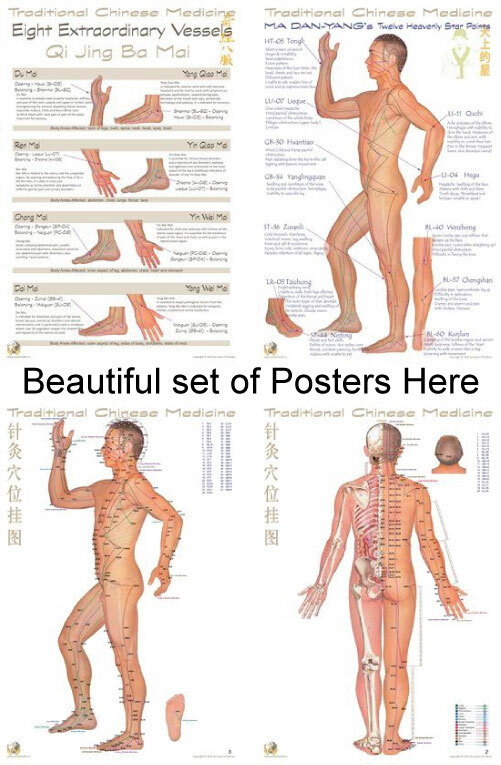 This entry was posted in Acupuncture, Conditions, Qi-points, TCM Diagnosis, Theory on March 16, 2015 by activehealth.ie. In the depression between the origins of m. sternocleidomastoideus and m. trapezius, on the same level with Feng fu (Du 16) below the occiput. Perpendicular insertion 0.5 to 1.5 cun. or through needling to Neiguan (P 6). 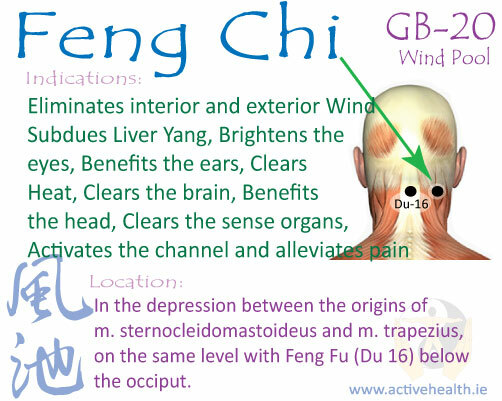 Feng Chi (GB 20) because of its location, is an essential point for treating all disharmony between the body and head, all issues of the head, brain (seizures, memory, mental/neurological disorders), face, throat and sense organs (eyes, ears, nose, tongue). Feng Chi (GB 20) translation of Wind Pool goes some eway to describe its function of eliminating Wind, both interior and exterior with symptoms such as (Exterior Wind) – fever/chills, stiff neck, (Internal Wind) – paralysis, twitching, tremors, numbness, dizziness, vertigo. It is a primary point when treating Headache, especially occipital and headaches located along the channel of the Gall Bladder. I find this point especially useful when treating pain, weakness, stiffness conditions of the neck, shoulders, upper back. Feng Chi (GB 20) is indicated in many texts for treating hypertension, especially due to Liver Yang Rising. This entry was posted in Acupuncture, Qi-points, Tuina on May 1, 2014 by activehealth.ie. 2 cun above Yangchi (SJ 4), in the depression between the radius and ulna, on the radial side of the extensor digitorum communis tendons. a cun is the distance between the 2nd and 3rd knuckles, or the distance at the widest part of the thumb. Additional: Yangchi (SJ4) is located on the back of the wrist, at the level of the wrist joint (crease) in the depression between the tendons of extensor digitorum communis, and extensor digiti minimi. 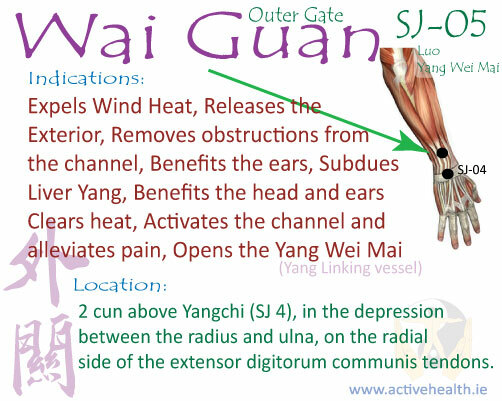 Wai Guan (SJ-05) is the opening point of the Yang Wei Mai of the Eight Extraordinary Vessels, which may be the most ancient body energetic system. Pain in the cheek, strained neck, deafness, tinnitus, pain in the hypochondriac region, motor impairment of the elbow/arm, pain in the fingers, hand tremor. Luo-Connecting points of one meridian can communicate with two meridians. They treat diseases of the collaterals and can be used to treat chronic diseases, especially chronic diseases of the Zang-Fu organs. Clinically, Luo-Connecting points are often combined with Yuan-Source points in the treatment of diseases. This entry was posted in Acupuncture, Qi-points, Tuina on April 19, 2014 by activehealth.ie. Make loose fist, Point is on the Ulnar side, on the end of the transvease crease, proximal to the 5th. metacarpophalangel joint on the junction of the red and white skin. 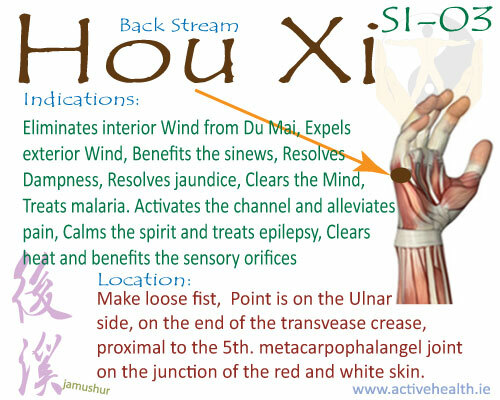 Hou Xi (SI-03) is the opening point of the Yang Qiao Mai of the Eight Extraordinary Vessels, which may be the most ancient body energetic system. Hou Xi (SI-03) is an exceptional point for neck and back issues when coupled with Bl 62. Shu-Stream points are where the Qi starts to pour down the meridian. They are known to alleviate heaviness and pain in the joints. Hou Xi (SI-03) is effective in the treatment of headache with stiff neck. It can be used when there are red eyes, deafness, contracture of elbow. Hou Xi (SI-03) is used to treat febrile diseases, night sweats, psychosis, epistaxis, paralysis of upper extremities. Hou Xi (SI-03) is prescribed for hypertension, hysteria, membrane on the eye, intercostal neuralgia, low back pain, lower limb neuralgia, jaundice, fullness in the chest, hand tremor, common cold, skin disease with itching, cold abscess. It can be used successfully to treat pain in the scapula, arm and or hand, it is suggested to combine with local points. Night sweats, combine with HT 6. This entry was posted in Acupuncture, Qi-points, Tuina on March 27, 2014 by activehealth.ie. In the depression between the medial malleolus and the tendo calcaneus, at the level with the tip of the medial malleolus. 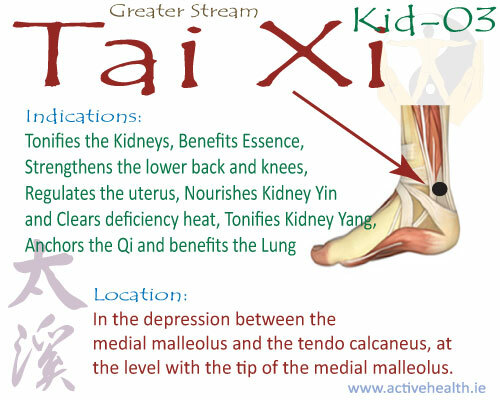 Tai Xi (Kid-03) is a unique point in that it strengthens the Kidney and as such it nourishes both Yin and Yang, which in turn nourishes all the Organs. 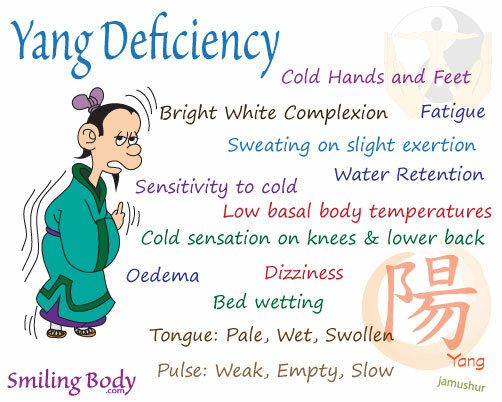 Tai Xi (Kid-03) is an important point to treat symptoms of Kidney Yin deficiency like, low grade sore throat that worsens with fatigue, constipation which is dry, headache and dizziness, chronic tooth decay due to lack of nourishment to the bones, loosening teeth, tinnitus or hearing loss. Balance between Kidney and Heart is essential. Kidney water cools Heart fire, and Heart fire warms Kidney water. When the Kidneys and the Heart are in disharmony the Spirit is disturbed giving rise to insomnia, excessive dreaming, and poor memory. Heart and Kidneys in harmony gives one the Will to follow and act on what the Heart desires. The Lungs and Kidney relationship is a strong one with the Lungs recognised as the ‘canopy’ and the Kidneys are the anchor. It is the Lungs function to breath in Qi and channel downwards to the Spleen where it blends with food and water, transformed into Qi and transported throughout the body. It is the Kidney’s function to grasp Lung Qi and guide it downwards. Kidney deficiency will give rise to breathlessness, coughing as Qi rebels upward, difficult breathing and Asthma. In Traditional Chinese Medicine, all sexual functions derive from the Kidneys. In men, seminal fluid is seen to contain one’s essence. In women the Kidneys connect directly with the Uterus and ovaries and is the source of a woman’s essence which is lost through menstruation and childbirth. Tai Xi (Kid-03) is the point of choice for all manner of sexual dysfunction including, impotence, seminal emission, and sexual exhaustion. Tai Xi (Kid-03) is chosen to treat Kidney disharmony, which manifests as chronic lumbar pain not associated with any physical trauma, weak and/or sore knees, dark circles under the eyes, propensity to fright and phobias. This entry was posted in Acupuncture, Qi-points, Tuina on March 24, 2014 by activehealth.ie. In the depression distal to the junction of the 4th. and 5th. metatarsal bones, on the lateral side of the tendon of m. extensor digiti minimi of the foot. Zu Lin Qi (GB-41) is an important point for stagnation of Qi, it promotes the smooth flow in the body. This can also be interpreted as de-stressing tension that comes from modern living. Zu Lin Qi (GB-41) is the opening point of the Dai Mai of the Eight Extraordinary Vessels, which may be the most ancient body energetic system. When combined with SJ-05, it is indicated for distention and pain of the breast, breast abscess, menstrual disorders and reticent menstruation, and is particularly used in situations where Liver Qi stagnation impairs the smooth flow and regularity of the menstrual cycle. Zu Lin Qi (GB-41) has an important role when treating headaches due to both emotional, and physical causes, especially occipital and vertex. It is an important point for menstrual pain and breast disorders. 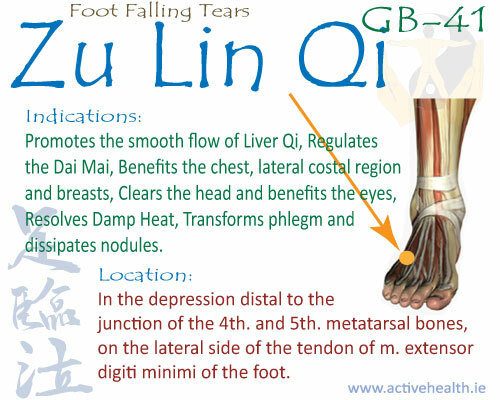 Zu Lin Qi (GB-41) as the name indicates – “falling Tears (foot)” is important for treating eye problems, redness, swelling and lacrimation issues, tearing, excessive lacrimation. Local point for lateral foot issues – pain, cramping. This entry was posted in Acupuncture, Qi-points, Tuina on March 21, 2014 by activehealth.ie. In the depression distal and inferior to the base of the 1st. metatarsal bone. 1 cun posterior to Sp-03, at the junction of the red and white skin. On the medial side of the foot, in the depression distal and inferior to the base of the first metatarsal bone. 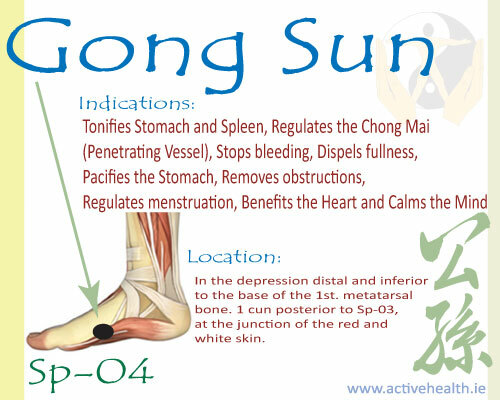 Gong Sun (Sp-04) is an important and frequently used acu points. It is the opening point of the Chong Mai of the Eight Extraordinary Vessels, which may be the most ancient body energetic system. Gong Sun (Sp-04) has an important role in harmonising the middle Jiao when there is excess type epigastric and abdominal pain. It is used to treat food poisoning and dysentery. It strengthens the Spleen. It regulates stagnation of Qi and transform Dampness. Treats pain in the heel. Gynecological and Abdominal issues due to stagnation of Qi and Blood – masses, fibroids, cysts, irregular menstruation. When combined with P-06 it can treat chest and heart pain and disharmony of the Mind, with sighing, anxiety, insomnia, nervousness. This entry was posted in Acupuncture, Qi-points, Tuina on March 13, 2014 by activehealth.ie. English translation: Inner Gate or Inner Pass or Inner Closure. 2 cun above the wrist crease on the cleft of the tendons of m. palmaris longus and m. flexor carpi radialis. Oblique distal insertion 1 to 1.5 cun for numbness of the fingers. 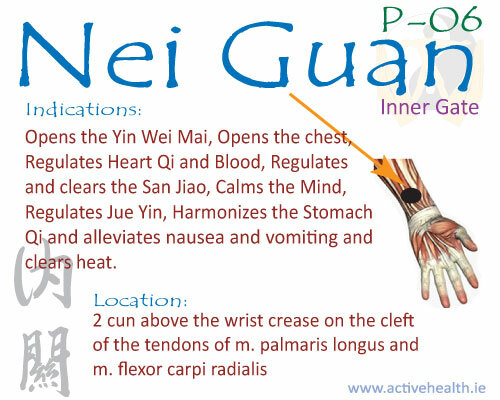 Nei Guan (P-06) is one of the most important and frequently used acu points. It is the opening point of the Yin Wei Mai of the Eight Extraordinary Vessels, which may be the most ancient body energetic system. Nei Guan (P-06) is one of the most important acu points when treating chronic the Heart arising from Qi stagnation. It opens and relaxes tightness of the chest associated with angina, asthma, palpitations. It should be considered with treating Insomnia whether of a deficiency or excess nature. Nei Guan (P-06) is frequently used in Shen or Mind disorders such as mania, nervousness, stress, poor memory. Nei Guan (P-06) is frequently used in nausea, seasickness, motion sickness, vomiting, epigastric pain. It is also a commonly used acu point in treating Carpal Tunnel Syndrome.